Champion Aerospace is a world leading manufacturer of aerospace ignition systems for turbine engine powered aircraft. 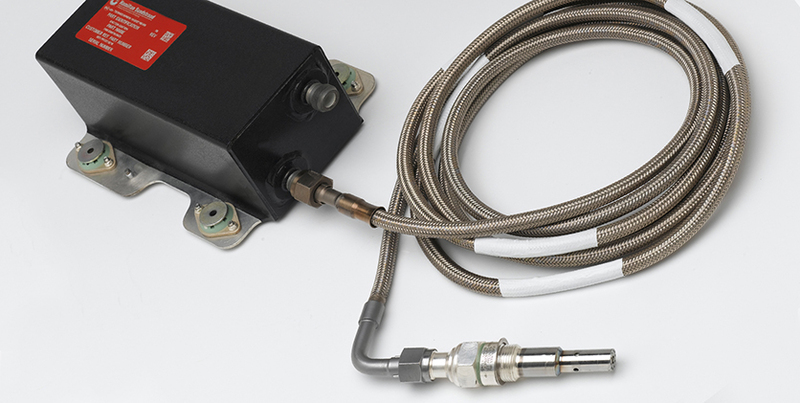 With more than 300 different igniter designs, 150 lead designs and more than 50 exciter designs in production, Champion’s ignition system products are specified as original equipment on engines from CFM International, General Electric, General Electric Power & Water, Honeywell, Microturbo , Pratt & Whitney, Pratt & Whitney Canada, Rolls-Royce, Solar, Sundstrand, Siemens, Turbomeca, Volvo, Wesinghouse, and Williams International. 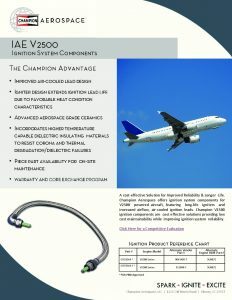 Champion Aerospace is also a preferred Tier 1 Ignition System Supplier to Esterline and UTC Aerospace Systems. There are three components of a turbine engine ignition system: the exciter, the ignition lead, and the igniter. The exciter takes input current from the aircraft electrical system, steps up the voltage, and delivers a high voltage output signal through the ignition lead to the igniter. The igniter sparks once its gap is ionized and the field between the center electrode and igniter shell breaks down. Champion fully supports ignition system design from low to high tension. 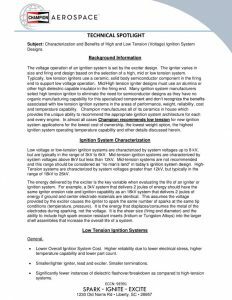 See Champion’s High-Low Tension Ignition System tech sheet on which type of system is optimal for your engine application. 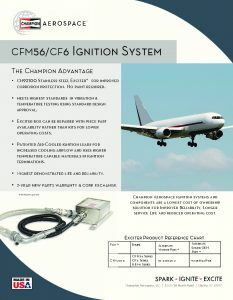 Champion’s ignition systems are optimized to reduce to total cost of ownership for the end user. Many of Champion’s ignition systems incorporate solid state switching technology for maximized performance, reliability, life and environmental considerations (non-radiation bearing exciters). 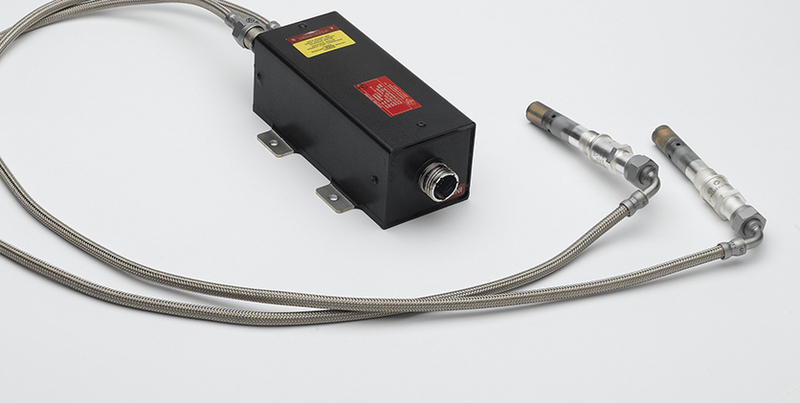 Champion’s ignition leads are matched to its exciters and igniters to minimize line losses within the system. They offer higher delivered energy than similarly constructed competitive brands, with less flashover and greater electrical shielding. 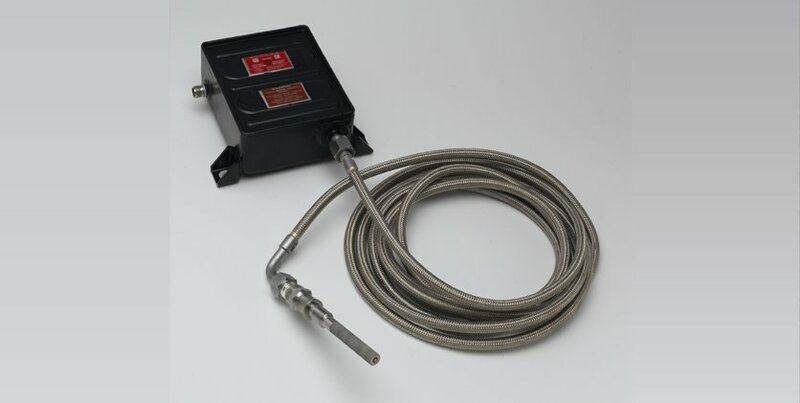 Champion also has ignition lead designs with advance materials to increase the temperature capability above standard industry available solutions. The igniter designs benefit from over 100 years of spark plug and igniter design and manufacturing experience. The result is the longest lasting, most reliable igniter designs in the turbine engine industry. 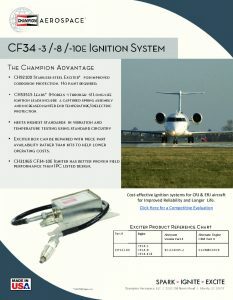 Champion Aerospace offers ignition systems for military, business, regional and commercial aircraft, featuring long-life igniters, advanced cooled and uncooled ignition leads, and reliable and robust exciter designs. Champion Aerospace also produces ignition systems for the power generation industry to include: land and marine turbines; oil, gas, and coal furnaces; space applications; oil rig operations and pumping stations. The Champion ignition system is a cost effective solution that provides maintainability while improving reliability. Virtually all components found in Champion Aerospace-brand products are manufactured in our Liberty, South Carolina facility by highly trained and dedicated employees. Champion Aerospace’s in-house innovations and technological advancements have helped prolong component life and reduce maintenance time, cost, and effort. Advanced computerized systems enable its employees to exercise meticulous control over each manufacturing phase throughout the entire operation, including the in-house production of ceramic insulators/semiconductors and machined components, and the assembly of exciters, igniters and leads. Computer aided manufacturing and fabrication processes are designed to meet exacting tolerances, and those specifications are met on every single product. This vertical integration means Champion Aerospace maintains absolute control and is never dependent upon products manufactured to quality standards less demanding than its own. ISO 9001 and AS9101 quality is engineered in every product at every stage of development and production. Through unmatched efforts, numerous patents have been secured for products and systems that make aviation safer and more efficient. All new product development and prototypes are designed, developed and tested in-house to mitigate program risk to the customer.